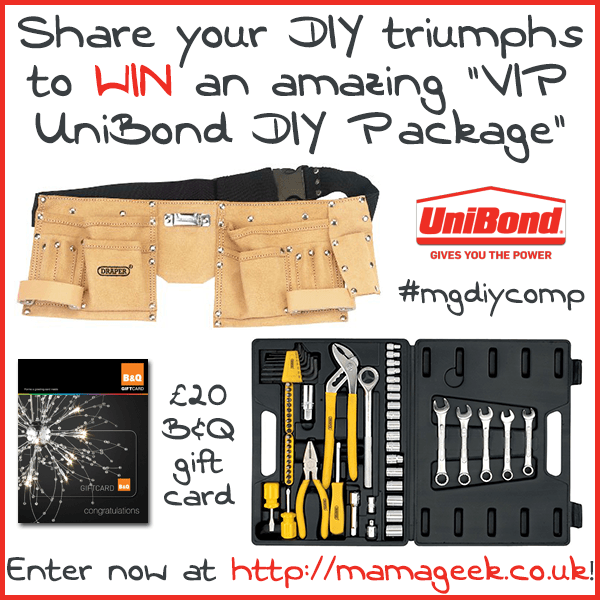 Today I have teamed up with UniBond to bring you a fun DIY competition, to win a “VIP UniBond DIY package.” All you need to do is share your best DIY job with me via e-mail or twitter (see below for details), and you will be in with a chance of winning this fab set of DIY goodies, courtesy of UniBond. The winner of this competition will receive a 61-Piece General-Purpose Tool Kit, a Leather Double Tool Pouch, and a £20 B&Q Gift Card. This competition closes on 23rd April 2014, and all entries must be received by 11:59pm on that day. I will post my favourite entries, and the winning photo, here at Mama Geek on 25th April. I will be contacting the winner directly to arrange delivery of their prize. UniBond are providing the prize for this competition to celebrate the launch of their new product range; UniBond Go. 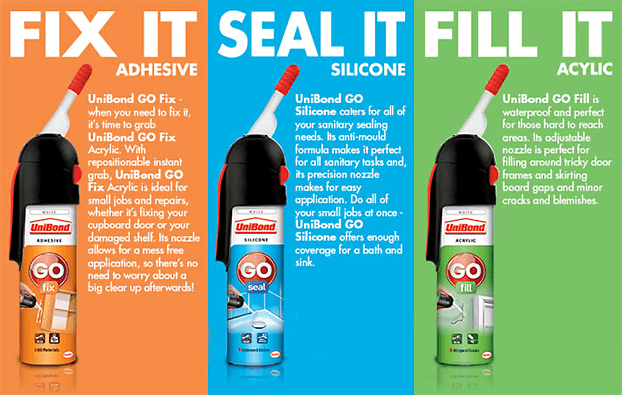 The UniBond GO range is the nifty solution for all your sealing, fixing and filling needs around the home. With its Easy Dispenser Unit, UniBond Go gives you the confidence to fix, seal and fill without the need of a professional. Tackle your DIY projects with ease and assurance that UniBond GO will help to get the job done! This new must-have household trio has been designed to provide users with complete ease and control. UniBond GO’s handy 100ml pack size makes it perfect for one whole job, meaning less waste. Its innovative Air Pulse ready-to-use applicator includes a trigger mechanism to allow users to execute with precision and skill – meaning no gun is required. The re-usable cap lid also enables simple closure, preventing any risk of dryness. The range is available in store now, for the RRP of £6.99. The prize draw is only open to UK residents. To enter, simply satisfy the Entry Criteria detailed above. No responsibility is accepted for entries which are lost, corrupted, incomplete or for any failure to capture entry information. Use of false details will result in disqualification. The entry must be made by the person entering the competition – entries sent through third parties, agencies or by automated means (such as scripts and macros) will not be accepted. Entries will be moderated. Entrants are required to meet the Entry Criteria but otherwise no other purchase is necessary. Entries to the prize draw will only be accepted between from the Start Date to the End Date inclusive. The winner(s) of the prize draw will be notified by email within 28 days of the End Date. It is the responsibility of entrants to notify the promoter of any change of contact details. The promoter will have the right to disclose the name of the winner(s). The winner(s) of the prize will be selected by myself, from a shortlist of five which will be selected by Bigjigs Toys. The judges’ decision is final. No correspondence shall be entered into. The winner(s) Name will be disclosed by the promoter on its website after the End Date. By entering the prize draw, you expressly agree to permit such disclosure if you are the winner. The promoter reserves the right to provide a substitute prize of similar value should the need arise. The Prize should be claimed by the relevant winner within 28 days of notification. If the potential winner cannot be contacted or the Prize notification is returned or is undeliverable, such potential winner forfeits all rights to any Prize, and an alternate winner may be selected. An unclaimed Prize may not be awarded. The Prize is non-transferable and no cash alternative is offered. The promoter shall not be responsible for damages, losses or liabilities of any kind, including without limitation, direct, indirect or consequential loss or damages arising out of or in relation to the prize draw. The liability of the promoter shall be limited to the maximum amount permitted by law. Nothing in this condition shall limit or exclude liability for death or personal injury as a result of the promoter’s negligence. The promoter of the prize draw is solely responsible for the delivery and quality of the Prize. Mama Geek accepts no responsibility for the delivery or quality of the products and services to be provided by the promoter. Tinyme’s Name Blocks Kickstarter campaign! Sounds like a good arrangement! Hi Tracy, I am afraid the kids & I have been quite ill over the past week but I am hoping to get a winner picked very soon and the blog post announcing it should be up on Friday. Hi, Did you pick a winner for this competition?